J'adore this book!! C'est magnifique!! Such a beautifully illustrated kids guide to Paris and it's top attractions. 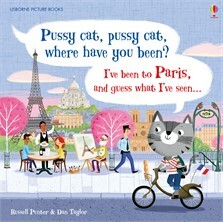 The Louvre, The Eiffel Tower, Montmartre and other top tourist spots in Paris are introduced to the reader as the Pussycat recalls where she has been on her trip. It's not an overload of information, and it doesn't feel like a fact book, but instead a story that would be perfect before bedtime, or even in the classroom.